Democrat Andrew Gillum withdrew his concession in Florida's gubernatorial race Saturday after a recount was ordered for the state's more than 8 million votes. 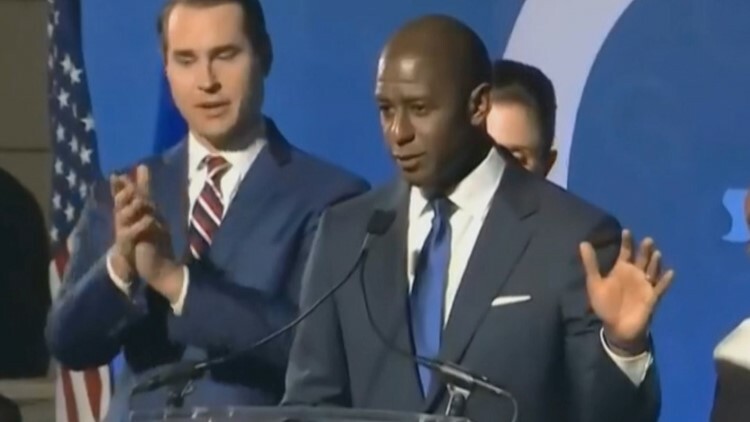 "Let me say clearly, I am replacing my words of concession with an uncompromising and unapologetic call that we count every single vote," Gillum said at a Saturday news conference. "I say this recognizing my fate in this may or may not change." With all counties reporting, Republican Ron DeSantis led Gillum by fewer than 34,000 votes or a margin of .409 percent. The race was one of three under a statewide recount. Margins in the Senate and state's agriculture commissioner were also under the half-percent margin needed to automatically trigger a machine recount. Without acknowledging the recount, DeSantis broke his silence and said in a 1-minute video released Saturday, saying that the unofficial results "are clear and unambiguous, just as they were on election night, and I am honored by the trust that Floridians have placed in me to serve as your next governor." He added that he appreciated the work of all involved to make sure all lawful votes were counted. "It is important that everyone involved in the election process strictly adhere to the rule of law which is the foundation for our nation," DeSantis continued. DeSantis has already moved ahead, appointing a transition team that includes U.S. Rep. Matt Gaetz, former Sen. George LeMieux, former Lt. Gov. Toni Jennings and House Speaker Richard Corcoran. "With the election behind us, it’s now time to come together as a state as we prepare to serve all Floridians," DeSantis said. "Since Tuesday night, that is what I have been doing and that is what I will continue to do in the days and weeks ahead as I prepare to take office as the 46th Governor of the State of Florida." In the Senate race, the Republican challenger, Gov. Rick Scott, claimed victory just before midnight Tuesday, but the incumbent, Democrat Bill Nelson, never conceded the race. Now, Scott leads Nelson by 12,562 votes or a margin of .15 percent. The contentious race led to lawsuits being filed by both Scott and Nelson. Scott alleged "rampant fraud" in the election and asked the Florida Department of Law Enforcement to investigate Palm Beach and Broward counties. Gillum focused on the accusations in his speech Saturday, saying Republicans appeared to be using his concession to fight against a recount. He also called out the president, U.S. Sen. Marco Rubio and Scott — all Republicans — for using over-the-top rhetoric "throwing out unsubstantiated claims of voter fraud and calls to stop the vote." "We don't get the opportunity to stop counting votes because we don’t like the direction the outcome is heading," Gillum said. In the race for the state's agriculture commissioner, Republican candidate Matt Caldwell and his campaign committee also filed a lawsuit Friday against Broward elections chief Brenda Snipes seeking to stop the counting of ballots that were not in hand when the polls closed. The Florida Democratic Party has accused Caldwell of trying to interfere with legal ballot counting. Caldwell is down by 5,326 votes or a margin of .06 percent in his race against Democrat Nikki Fried.